Layla and Jenna's playroom is just off the living room/kitchen area. It's a perfect set up because I can leave them to play and be within earshot of all their shenanigans. One day, as I was putting away the dishes, I began to realize that it had gotten awfully quiet toward that end of the house. I immediately grabbed my camera and caught them red-handed! Jenna: "I swear, it wasn't my idea!" Layla: "Wait a minute...I can explain!" Jenna: "Mommy, you're not mad at us, are you?" How could I be mad at these angels? I'm sure this is just a sampling of what's to come and how they'll weasel out of any punishment using nothing but their darling faces! Neither Layla or Jenna have enough hair on top to wear a bow, but Layla has this wild flip thing going on in the back. I think it's awfully cute, but it's rather unruly. I thought we should have it cut to even it out and then let it grow from there. Jenna didn't really need a cut, but I couldn't fathom getting one cut and not the other! So, last Saturday, we headed to Snip-its for the girls' first haircut! Check out all that hair in the back. Layla definitely has the "business in the front, party in the back" look going on! Jenna's hair isn't too long, but could use a little evening out. After we signed in, the girls browsed through a few magazines in the waiting area. First up was Layla. She did not want to give up that magazine...it must have been a captivating article! But once Sarah turned on the tv, Layla was ready to roll. I'm not sure what was playing on the tv, but we may need a copy of that video. Layla: "How's it looking guys?" Jenna was next...she looks a little frightened. Jenna: "Ahhh! What was that? Oh, it's just water." Jenna: "Wait a minute...no one told me there was a tv! Now this, I could get used to!" After the haircuts, the girls each got a card to stick in the prize machine. Layla was not really into it. She just wanted to read more magazines. Jenna, on the other hand, loves being rewarded for sitting in a chair and watching tv! Jenna: "Ooh, what did I get?" Mommy even got a little keepsake to take home! During this time of year, many of Trey's Sundays are Softball Sundays. He plays on a team with a great bunch of guys and really enjoys spending time with them. Layla, Jenna, and I don't usually go to his games because some of them are well past their bedtime and it's often just way too hot. However, a couple of Sundays ago, the girls just begged and begged me to go watch Daddy play. I told them I would take them if they promised to stay on the blanket and eat their picnic dinner while watching the game. I learned these girls do not know how to keep a promise! Nonetheless, we had a great time and will probably venture out to do it again! Layla: "Sissy! Remember what Mommy said about staying on the blanket?" Jenna keeps a close eye on Daddy as he gets ready to pitch. Jenna: "Wow! Did you guys see that pitch??? That's my Daddy!" The girls got front row seats...they didn't want to miss a single second! Jenna: "Good job, Daddy! Keep up the good work!" Layla is staying cool while looking cool in the only ounce of shade (provided by our stroller) at the ball fields. Daddy took some time out to get a pic with his biggest fans. Like I said earlier, the girls had so, so much fun! I'm sure they will talk me into taking them to another game real soon! 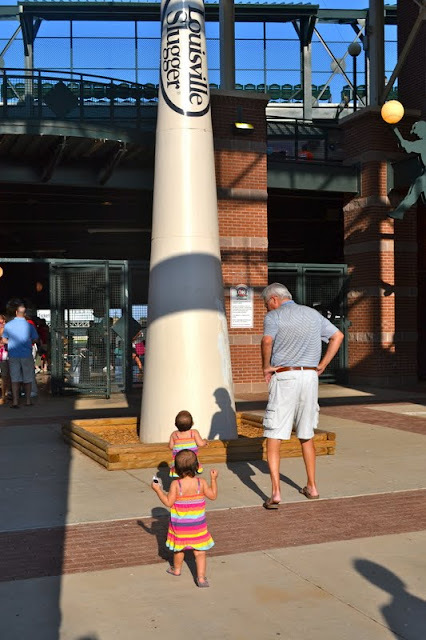 A couple of weekends ago, we celebrated Pop's birthday by taking in a OKC Redhawks ballgame. If you remember, we did the same for his birthday last year. Last year, Layla and Jenna were just shy of 3 months old and, I'm sure, had no clue there was a even baseball game going on around them. Similarly, at 15 months, I'm sure they still had no clue there was a ballgame going on because this time they were just downright too busy! Here's a picture from last year...my how things have changed! On the way to the ballpark with Lolli and Daddy! Layla spotted the UPS buffalo (random, I know) and just had to try him on for size. Here she is thanking Daddy for helping her get up there. "Whoa, Pop! That's the biggest bat we've ever seen!" ...and snack traps full of Teddy Grahams. Jenna: "Don't forget about me!" Overall, the girls did great. Just about the only time we had tears was when we tried to make them share a seat for a picture. How dare we?!?! At one point, Jenna was tired of being at the seats so Pop took her to roam the concourse. Look where she headed! What is it with that girl and beer??? Luckily, they ID'd. This was our cue to head home! Happy Birthday, Pop! We love you very much!!! Grandma and Grandaddy came over for a short visit over Memorial Day weekend. Just before they arrived, the picnic table and slide they ordered for the girls were delivered. Of course, Layla and Jenna wanted to check out their new loot, so we spent the afternoon having a little backyard fun! Daddy got it all set up while the girls were napping. "Holy cow! It must be Christmas!" Jenna: "Hey, I remember this thing!" Layla: "Wait for me, sis! Don't you get started without me!" "This thing never gets old!" 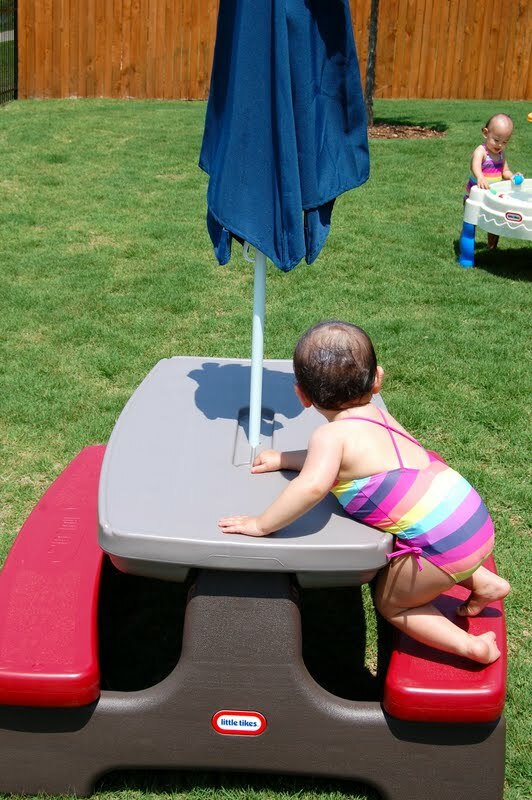 It didn't take long for Jenna to spy the picnic table. Layla: "Now, sis, remember the importance of staying hydrated." Oh, geez...looks like Jenna is up to no good! Jenna: "Um, folks! It looks like I may have gotten myself into a bit of a predicament." Jenna: "Hmmm, how am I gonna get myself out of this one?" Jenna: "Let's see. First, I'll lower myself down to my healthy-size belly." Jenna: "Then I'll scooch back until my feet hit something solid." Jenna: "Ahhh, there we go. Goodness, I'm proud of myself!" Layla: "Hmm, this looks interesting!" Layla: "Hey, people! Am I doing this right?" Layla: "Thanks, Daddy, for the help!" Jenna: "I can do it, I can do it!" Look how excited Jenna got when she spotted the pool! Jenna: "Let me in, let me in!" Jenna: "Whoa! This is refreshing!" 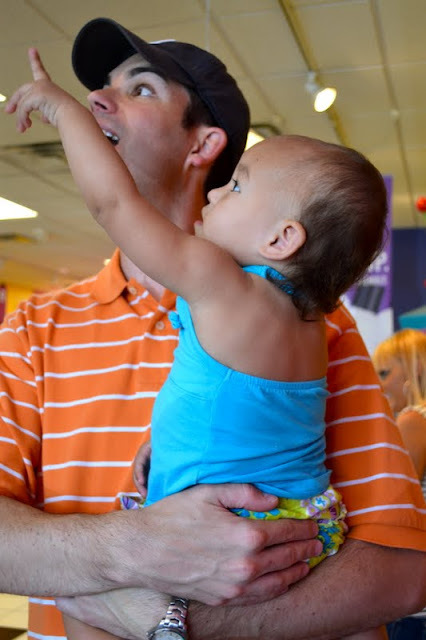 Layla: "Ooh, Daddy! An outdoor bathtub!" Layla: "Hey, those are my bath toys!" Jenna: "Are you having a blast or what?" Thank you Grandma and Granddaddy for the new slide and picnic table and for coming to watch us play!